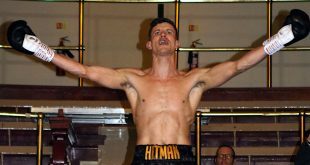 Frank Maloney and Steve Wood put on a big show at Robin Park Centre in Wigan, England last night, with two British and two Commonwealth title fights on tap along with a host of undercard bouts. There was a lot of action on the card with three vacant titles being sorted out, one title changing hands and five bouts finishing early. 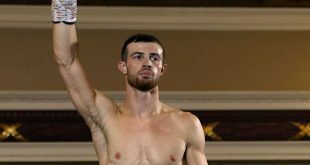 In the main event, Welling's determined Gary "Hot Stuff" Woolcome overcame tough southpaw Marcus Portman to win the vacant British Light Middleweight title when it was determined that the West Bromwich man couldn't continue after the ninth frame due to a bad cut above the right eye. 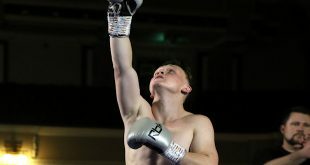 The bout started off with Woolcome advancing behind the jab, looking to unload the right hand upon the patient Portman. Once Woolcombe was inside, the fighters each let go with both hands at close range with an unbridled ferocity. But during the firefight, both men were clearly cut after no more than a minute had elapsed in the contest. Woolcombe showed a spill crimson in the scalp, just above the hairline, while Portman suffered a cut above the right eye. Undaunted, Woolcome continued to leap in behind the jab in the second but was eating big left crosses from Portman for his trouble. Woolcome then began to target Portman's injury, which by now is bleeding badly, with the jab. The third sees the contest become a rough, physical affair with Portman engaging more vigorously when Woolcombe gets in behind the jab. Portman gets in more big counter straight lefts before Woolcombe scores strongly with a booming left hook. By now, both combatants are streaked with blood but Portman's cut is the worse for wear. Woolcombe goes effectively to the body but still is getting clipped by Portman left hands. Woolcombe nails Portman with a right and that touches off a mid-ring battle which no one wins clearly. Woolcombe bullies Portman to the corner and clocks him with a right before the West Brom hero fights his way off. Woolcombe comes out for the fourth like a man possessed, rattling off rapid fire shots one after another, but Portman wisely covers up and lets the assault wear down. Woolcombe begins to slow down but continues to attack at opportune moments and gets in a few smart combinations before Portman slams home a power left to back him off. Woolcombe slips and goes down on the canvas shortly thereafter and gets up only to have Portman shake him with a hard left counter. Woolcombe ends the fourth clearly frustrated. The fifth sees Woolcombe a bit more cautious than the previous round as Portman waits for him to come in behind the jab. A skirmish breaks out in the center of the ring and Portman gets the last word with a sharp over the shoulder left hand but Woolcombe walks through it. Portman goes on the attack and lands a good combination. Woolcombe fights back with a right to the ribs and a left hook upstairs before they scrap in the middle of the ring, trading hooks. Portman just misses with a big uppercut as Woolcombe pushes him into the ropes to end the round. By the sixth, both combatants are bloody and Portman's eye is a distraction to him, pouring claret and making it hard for him to see Woolcombe's left hands. Woolcombe takes advantage of the situation and comes crashing in with right hands. The South London aspirant seems to be taking control of the bout with Portman starting to noticeably flag under the combination of pressure and injury. Woolcombe presses his argument with right hand, left hook combos until Portman strikes back with a series of sharp right hooks that stems the tide momentarily. The pace picks up with a riveting body shot contest in the middle of the ring that Portman bring to a close with a big right hook upstairs. 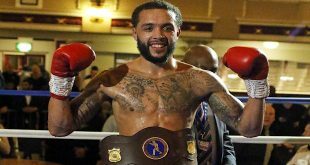 The seventh sees Woolcombe adopt Portman's cautious, wait and see posture as the pair try to out-feignt each other until "Hot Stuff" breaks the standoff by lunging at his rival with another lead right, left hook combo that earns him an uppercut from the badly bleeding Portman. Woolcombe asserts himself strongly as he begins to pick apart Portman with jabs to the head and body before launching himself behind a two handed volley that sends Portman covering up onto the ropes. They trade big right hands but Woolcombe looks mentally stronger at this stage of the bout. But brave Portman refuses to buckle and lands a good uppercut close in while on the ropes and pushes Woolcombe off to gain some breathing room. They clinch in the middle of the ring and trade short shots before the ref forces them to break. Woolcombe comes in behind a crashing right but Portman bangs him with a crisp left hand in close before they clinch again, trading body shots. Portman hammers Woolcombe with a big left but he misses a winging combination as the round ends. Taking shots to land his own is Woolcombe's policy to start the eighth as he attacks Portman with a fury and the southpaw looks to have lost focus. Portman gathers himself catches his adversary with a riveting left hand before Woolcome returns the favor and Portman is clearly hurt. Woolcombe unleashes a torrent of abuse as he has Portman covering up on the ropes until the referee calls them to break. Woolcombe's scalp cut is now worse but it's not as bad as Portman's eye. Woolcombe bulls Portman back onto the ropes and they trade hooks before Woolcombe gets sloppy and is nailed by a Portman uppercut that has lost it's steam. Woolcombe busts up Portman on the ropes and the end looks near until the bell rings to end the eighth. Before the ninth can begin, referee Edwards calls off the contest due to Portman's eye injury and Woolcombe is elated as he's declared the new British Light Middle Champion. Portman loses for the first time in seven bouts, dropping to 18-6-1 (3), while Woolcombe sees his record to 25-1 (10).